AEGIS: The IKOMED X Ray Radiation Reduction Solution | IKOMED Technologies Inc. Existing pulsed-fluoroscopy systems expose a certain area (field-of-view) of the patient’s body to a series of short X-ray pulses that capture an image time-series at the detector and present them to the surgeon as a fluoroscopic movie. In most cases, the surgeon performing the procedure is interested in a smaller region within the full field-of-view, where the eye focuses. The surrounding area of the image, while required for the purpose of orientation, is of less importance. This region-of-interest is primarily limited to the area around the tip of the catheter, or the device being used during the procedure. IKOMED’s technology is based on an innovative, patent-pending, fast-moving lead shutter that is automatically adjusted in size and position before each X-ray exposure pulse. The shutter and supporting mechanisms are used to create an image with a region-of-interest that is exposed at a standard level of radiation, while the remaining parts of the image are produced by a lower radiation dose. This advancement reduces the amount of radiation exposure to the patient and scattered radiation to medical staff. Some of the concepts of our technology are depicted in U.S. Patents 7,983,391, 8,693,628 and U.S. Patent applications 2012/0215095, 2013/0272504. 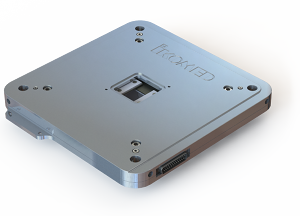 IKOMED’s product, AEGIS, is an integrated hardware and software solution that complements the existing fluoroscopy equipment of leading medical imaging manufacturers. Our technology results in up to ten-fold reduction of ionizing radiation exposure during fluoroscopy, responding to radiation safety concerns expressed by patients, medical staff and regulatory bodies. IKOMED Technology Inc. – Reducing Radiation Exposure.